Finance Alert is a free program that provides computer users with the latest news from the financial world. The program displays information in pop-up windows in the upper-right corner. In order to turn off the financial alerts, the key combination Ctrl+Alt+Z has to be pressed. This seemingly harmless program is advertised at financenewsalert.com, and it may also be bundled with freeware; hence, you should be very attentive every time you are about to start the installation process. 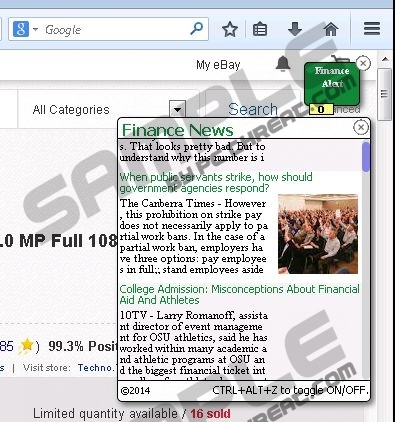 If you are reading this report, you probably want to remove Finance Alert from the computer because you have just noticed that some pop-up advertisements are displayed within Internet Explorer and Mozilla Firefox. Finance Alert is an advertising-supported program which displays coupons, web banners, and other advertisements in order to enhance your shopping experience. Finance Alert pop-ups are mainly displayed on shopping websites, such as amazon.com and walmart.com, but you may encounter some advertisements on other websites, too. Finance Alert declares that they do not allow unreliable third parties to provide you with questionable pop-ups, but seek to deliver high-quality advertisements. However, you should bear in mind that Finance Alert does accept responsibility for third parties and their activities. By installing the program, you accept responsibility for your actions, and we recommend that you remove the Finance Alert program from the computer as soon as you can. The advertising-supported program may record certain non-personally identifiable information in order to understand your preferences and browsing patterns. Finance Alert collect information regarding your search terms, browsing history, operating system, etc. Finance Alert does not share identifiable information without your permission, but some anonymous information obtained from your browsers may be disclosed to third parties. If you do not want to be monitored and interpreted by unknown companies or service providers, simply remove Finance Alert. Finance Alert does not create any browser extensions or add-ons, but runs using a service named FinanceAlertService.exe. It is not enough to kill the unwanted program in the Windows Task Manager because the process will renew after the first reboot. In order to have Finance Alert removed, you should implement a powerful anti-malware program which is capable of eliminating adware, ransomware infections, browser hijackers, Trojan horses, and other unreliable programs. Use SpyHunter if you want to get rid of Finance Alert right now. This real-time anti-virus program can easily protect you against various threats so that you can browse the Internet safely. Press Win+R and enter control panel. Click OK.
After uninstalling the adware program, you should install a powerful scanner which can identify Finance Alert and other unreliable programs. If you want to ascertain that Finance Alert is fully removed, install the scanner available below. Quick & tested solution for Finance Alert removal.